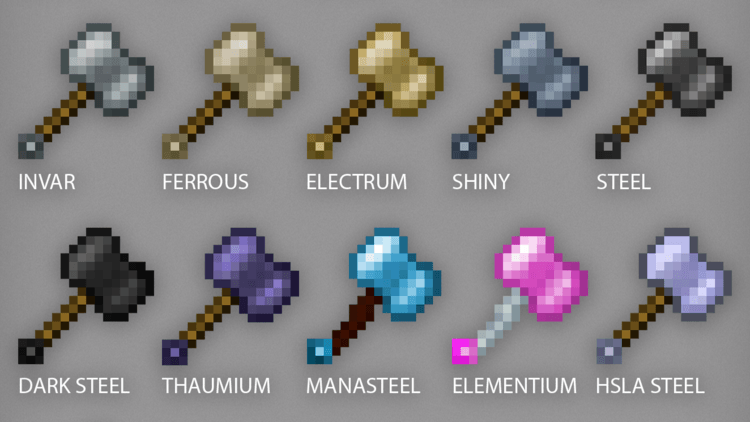 Hammerz mod 1.12.2/1.11.2 has added series of hammers with similar features to the hammers you create when using and installing mod Tinker’s Construct in Minecraft world. Mod Tinker’s Construct is one of the most famous and favorite mods in Minecraft community all around the world in Modpack Survival, RPG, Adventure by its flexibility as well as new tools for the players. One of the highest evaluated tools in digging, discovering minerals and destroying large constructions is Hammer – a convenient tool that Tinker’s Construct has brought to the users. Hammer allows the players to destroy an area of 3x3x1, helping the players to discover quicker, as well as creating massive tunnels without wasting time and work. 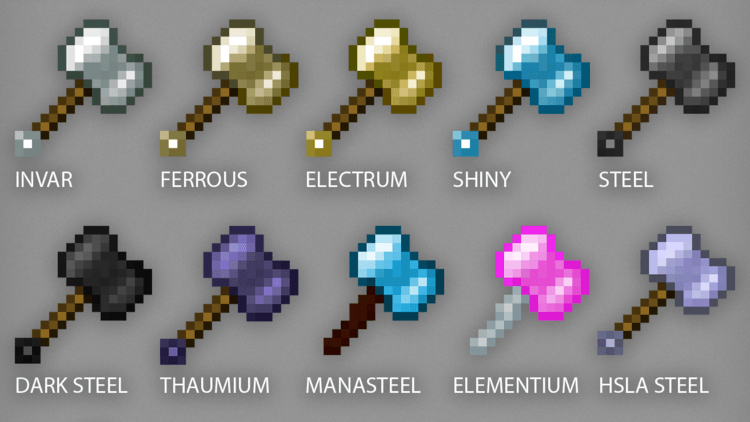 Hammerz is a mod focusing on some sides of that Hammer. That going along with its convenience, it has a price. 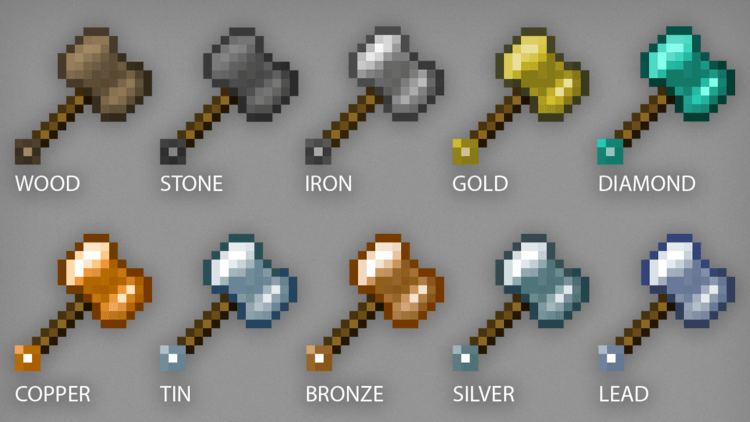 To create a hammer, you need three ore blocks depending on types you want to use. It means if you want to create a diamond hammer, you need 27 diamonds and two wood sticks, and some large number of crystals. Don’t worry, if you know how to use these hammers actually, you will get the resources spent and benefit other two or three ones if you like. Hammerz is comfortable with a lot of mods relating to ingredients. 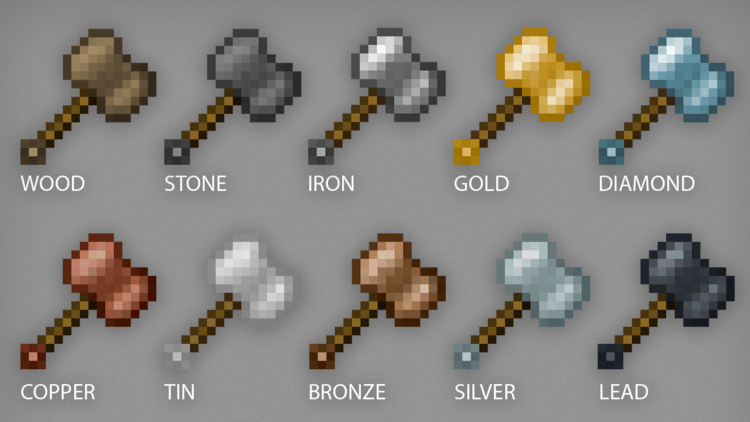 These days, the players can create the hammers using Dark Steel of EnderIO, Thaumium, Manatsteel and Elementium of Botania, HSLA Steel and Bedrock of RotaryCraft, Steel, Copper, Tin, Bronze, Invar, Ferrous, Silver, Lead, Electrum, and Shiny. Moreover, you can choose between two types of display for these hammers: default and explicit materials. Hammerz requires Forge Mod Loader and Minecraft version 1.7.10/1.8.9/1.9.4/1.10.2. Put jar file of Hammerz into mods folder and then run Minecraft. Done!